With the HEINKEL Dip Coating Centrifuge V 425 TT, we offer our customers an economical solution for the coating of small parts with oil, paint, adhesive binders and the like. It spins away excess coating material optimally and it is also easy to install. For hazardous Ex zones HEINKEL has developed and built the Dip Coating Centrifuge V 450 TT Ex. Economic coating of small parts with oil, lacquer, adhesive coatings etc. With the housing lid open, the perforated basket is lifted out of the centrifuge. The exposed paint container can now be filled with the paint or coating agent. The perforated basket is filled with the parts to be coated and put back into the centrifuge. The paint container can be lifted through activation of the hand lever, which dips the perforated basket with the product into the paint or the coating agent. Once all parts are covered with paint and with coating agent, the paint container is lowered again. The housing lid is closed and locked by means of a pivoted lever. The centrifuge can now begin. The desired basket speed is set via a hand-wheel of the expanding disk adjustment. The centrifugal force spins off the excessive paint and coating agent from the parts and the paint is returned through bore-holes in the basket shell to the paint container. 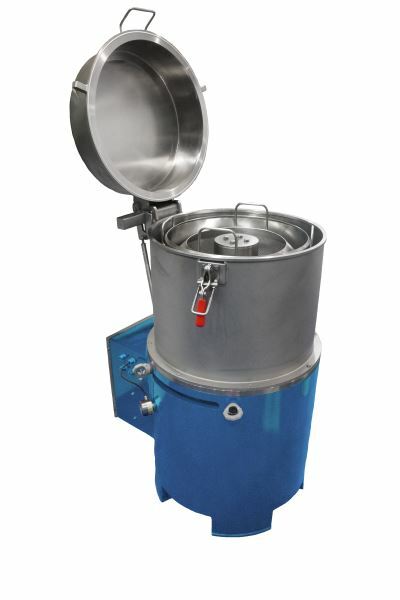 The duration of centrifuging depends on the consistency of the paint, respectively coating agent used and the condition of the parts to be dipped. 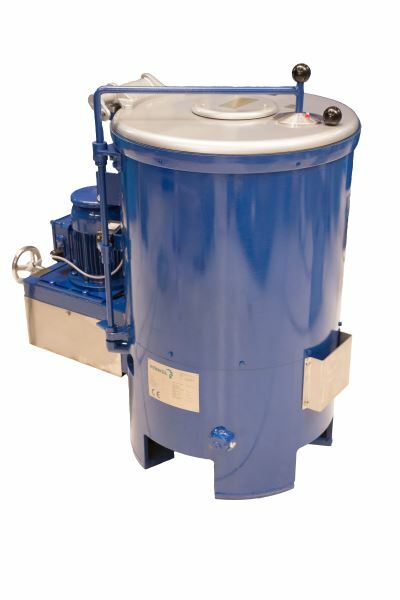 In order to paint, and coat all parts evenly, the dip-coating centrifuge is equipped with a reversing circuit. Reversing the spin direction changes the position of the parts so that they are again coated by the back-flowing paint and coating agent. Pressing the stop button reduces the speed of the perforated basket to zero. The housing lid can now be opened, and the basket lifted out. The colored, and coated parts can now be put on a tray or into a drying cabinet for after-drying. The outer casing of the machine is made of two parts. The bottom casing section is made of die-cast GGG 40 supporting the bearing of the centrifuge. For the purpose of cleaning the inside volume, the protection jacket on the bottom casing section has been arranged to be easily detachable. The upper casing section is closed by a hinged lid, the balance of which is maintained by means of a gas spring. A venting cover is provided on the cover. An opening is provided in the outside jacket for the extraction of solvent containing vapours whereby this opening is in the instance of the basic machine blanked off. The mechanism for lifting and lowering the lacquer container is arranged in the bottom casing section of the machine. The dipping process is run manually by operating a swivelling lever. The container with the coating material can be easily exchanged. After having been filled, the centrifuge basket is placed onto the basket shaft. In order to cut downtimes as far as possible, the use of a second basket is recommended. Both jacket and bottom of the basket are provided with strainer-like holes of 3.0 mm in diameter. The close arrangement of the holes allows for rapid access of the coating material during dipping, while at the same time allowing for complete removal of the liquid during the subsequent spinning process. When treating parts which owing to their size would be ejected through the holes in the basket, then a fine wire mesh can be placed in the basket. Custom baskets made of stainless steel are also available. As to the bearing design, special design considerations were taken in to account regarding sealing of the shaft side of the basket, so as to prevent the ingress of solvent containing coating material. Moreover, the shaft bearings have been designed in consideration of the operating conditions for a calculated service life of 15,000 hours. The centrifuge is delivered ready for immediate operation.